How cool is observing with binoviewers? This may sound like an utterly stupid question, but what’s the deal with binoviewers? This is not me questioning the benefits of binos, it’s just that I never had the opportunity to use this kind of device and I really wonder how it feels compared to classical observing. I mean, I understand that observing with your two eyes must bring some benefits, I read some of you guys reporting how awesome it is when you look at the Moon with a bino, but could someone try to put in words how it feels to use a bino compared to a regular eyepiece? Are binos only, or mainly, good for lunar and planetary observation? use binoviewers - including me ! 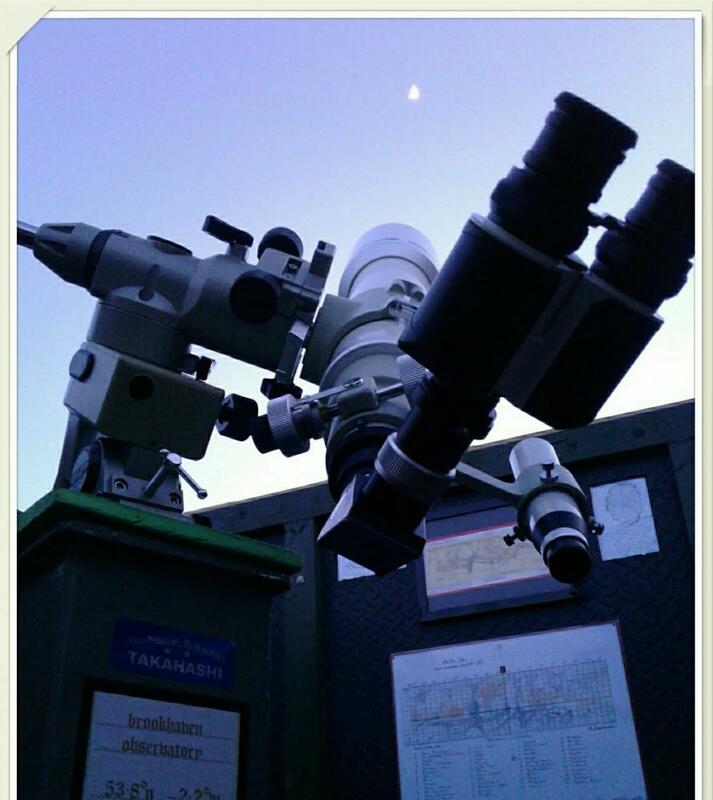 Earlier this week, I to to view through dual 10" Newtonians attached side by side with binocular vision. It was amazing. Downfall is some loss of light, naturally. So they may be better suited to larger aperture scopes. Depends on your scope aperture. If you have a small refractor you may only use binoviewers on Moon, planets and bright DSOs . If you have a large Dob you can also use them on dimmer DSOs. However the dimmest DSO and largest objects still need single eyepiece. The binoviewers half the light to each eye, but your brain merges both images and increases signal to noise by squareroot of two. Compare one eye closed to both eyes open - both are more natural. However eyepieces and system do limit the AFOV, and most prefer 24mm 68AFOV panoptics. I would also recommend Denkmeier or Earthwin with powerswitches to reduce the number of eyepiece pairs you need. If you belong to a club try to link up with a binoviewer observer, to try before you buy. 10% of people have trouble merging images, especially at higher power. P.S. Binoviewing is almost always higher power than single eyepiece due to the binoviewer length and OCSs to focus. Binoculars provide much wider TFOV. And yes we do both! The short answers to your questions. No, deep sky views awesome too. Since getting binoviewers, I use them a lot more than single eyepieces on a lot of things. I also have a C-8 and the first time I looked at the moon was OMG! I really did get the impression that I was floating ove the moon some how. My notes for the evening was "the only way to view the moon"! Also they work great on the planets. Have tow relaxed eyes really does help a lot. Star clusters and bright nebula do well as well. M42 with a UHC filter looks almost 3D. For the price of an expensive eyepiece, $200 they are a great investment. I have the William Optics pair that come with a set of 20mm EP and a 1.6x barlow. Buy used if you can. PS, get them ASAP while Orion is in prime viewing time this month. I definitely prefer binoviewing whenever practical. My favorite targets are the Moon, planets, and globular clusters (incredible! ), but I will take a crack at pretty much anything that will fit in the field of view. It is just a more relaxing way to observe...easier on the eyes. I have been enjoying both binoviewers and a binoscope for some years now. I find them especially good for lunar and planetary views as well as the brighter DSOs. Collimation becomes more critical as magnification increases. Using powers up to 413x in my previous TEC 200F15.5 Mak meant that collimation had to be perfect. Currently I am using the binoscope more but still enjoy the Zeiss binoviewers occasionally. At the moment I am really enjoying the LOA21mm eyepieces in the binoscope. Binoviewers are not really compatible with my bigger scope, an 18" F3.5 which is fitted with the SIPS system, so only mono viewing and mainly on DSOs. As far as i know, according to ancient myth, there was once a Cyclops. Perhaps he would be a natural with a single eyepiece view. But for the rest of us, two eye viewing is the natural way to see things. That is the way we are wired. At my age comfort is almost everything. I hear ya. Well, it was a couple more on the coast of the Baltic sea. A total of 6 nights since October. SMH. It's my first season and it ends end of April when it won't be dark enough at reasonable hours. I use a TS-Bino (can recommend them. Had BST before, 2 units, and can not recommend) on a fast 100mm achromat with 1.6x barlow to reach focus. I think, with a C8 you can reach focus without barlow. Walking on the moon is really something else at bi-53x. So far, I mostly enjoy just slowly cruising around the gem-studded satin sky. Everything feels more real, more immersive, more "there" with binoviewers compared to one-eyed viewing. Try watching a movie with one eye - it's less enjoyable if your brain is used to 2-eyed perception. Comfort is the really big benefit in my book. 2 eyes working together are better in every respect. FInd a way to try a BVer in your 8" SCT. Mine is great on the moon, planets and brighter DSOs like M42. No comparison to cyclops viewing. Perceived detail goes WAY up. Edited by Bob4BVM, 06 February 2019 - 01:37 AM. I can see dim stars better with the binoviewers compared to cyclops. I tried a test and two eyes saw the dim stars a lot easier. Comfort is just so much better. The only thing I can't do is obviously get a really wide FOV as I do with some single eyepieces, except for my two 12.5mm baader morpheus, which does not vignette at all in my WO BV'ers. I've been using a cheap Revelation binoviewer for about ten years now. I used it along with a cheap SW 2X delux barlow in my SW 120ED until 2015, then I upgraded my scope by dropping down in aperture to a Tak FC100DC, and still use the same binoviewer and Barlow. Two years ago almost, my friend Rodger, who wanted to check out the new FC100D scope, spent an evening really putting it through its paces. He brought with him some very nice top end eyepieces, one of which was a TMB 5mm super monocentric. It was early April and the moon was high in a pristine sky. The seeing was as good on this evening as ive ever seen, so it couldn't have worked out better for assessing the new Tak's capabilities. Looking at the Moon through the FC with the 5mm super mono in the Tak prism, the view was unimaginably sharp. The magnification was only 148X but still highly detailed and very well defined. I, along with my observing buddy Paul who had brought his Tak FC100DL along for comparison, was wowed by the super mono. Then I suggested we try the binoviewer and a couple of cheap 16.8mm Abbe Orthoscopics. The Moon suddenly became three dimensional and the level of detail was in an entirely different league. The super mono was superb, but the binoviewer plus 2X barlow and paired 16.8 Abbe ortho's was, in the words of my friend Paul, "a real game changer)! It's hard to put into words just how good a binoviewer is when used to observe the Moon and planets, and how intricate detail on the border of detectability in a single eyepiece, becomes very easily observable with the use of a binoviewer. At the outset I mentioned that the binoviewer and Barlow were cheap, as are the 16.8mm Abbe Ortho's, yet this combination, costing in total less than a single top end eyepiece, not only out performed the top end eyepiece, it did so in a massively impressive way. Stunning, breathtaking and jaw dropping are all under statements to say the least. When looking at Jupiter using the same FC100DC and binoviewer/barlow arrangement, the equatorial belts give an almost 3D braided appearance, and white ovals, barges, garlands and festoons etc can be seen with great ease. Even the Great Red Spot reveals its vortex nature. I know we all love our high end eyepieces and dream of acquiring a mouth watering selection, but for lunar and planetary, I have yet to see any mono eyepiece of any make beat the view given through my cheap binoviewer an eyepieces! Mike, glad to heard you enjoy in your binoviewer. I do same, and tottaly remove and forgot how is to monoviewing. That's quite the story! Great glass you have! What is the focal length of that Tak FC100? In my simple C102 f/1000mm, a pair of Brandon 16mm (62x) is really sharp on the moon. I haven't tried the barlow yet with them. The FC100DC is 740 mm focal length. Your 16mm Brandons would be terrific in a binoviewer with a 2X barlow! Well, I try my 1.6x with them on my next night out on the moon. I'm going to have to stick in in front of the diagonal, so it will end up being more than 2x. Thanks! This is good point although the 40% increase is still only about 70% of that of monoview. User dependent usually dictates who sees more in BV compared to monoview. From what I have seen, two eyes compensate for that loss. Things are brighter with two eyes, from my experience. It's also a lot more more comfortable with two eyes. My nights of squinting with one eye are over.